The Solent Sunbeam Class enjoyed the 30th running of the Chisholm Weekend over the early May Bank Holiday weekend at Itchenor Sailing Club. Read about the background to this event. The weekend is always one of the best-attended events in the Solent Sunbeam Class and this year was no different. Sir Henry Chisholm was instrumental in growing the class at Itchenor in the 1960’s and no doubt contributed to what is still a popular Class, which this year is celebrating its 95th Anniversary. Glorious sunshine and light winds were the order of the day for all four races. 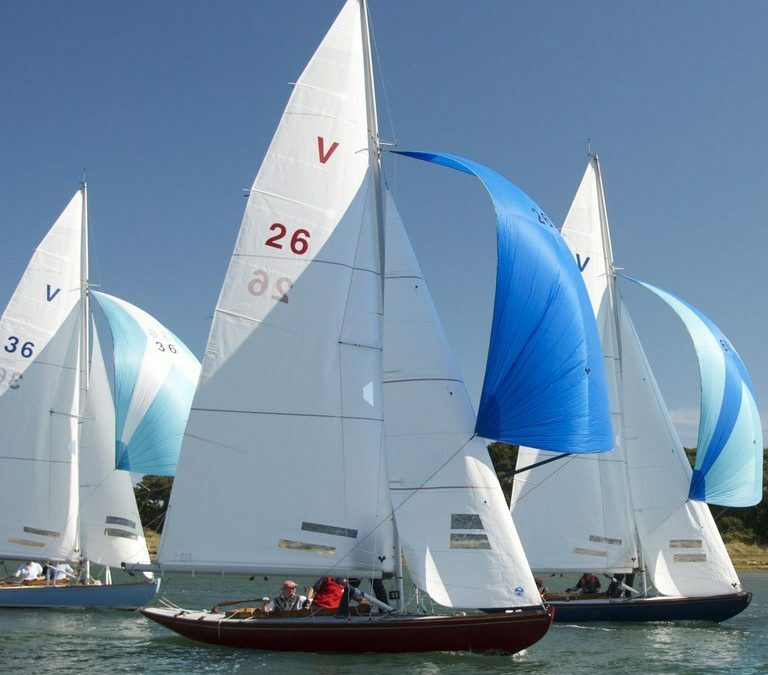 Twenty Sunbeams raced over the weekend and the light winds combined with sailing over the high tide meant that those finding the best breeze were handsomely rewarded for their skill. In the first race, V41 Fleury sailed by Joe and Cathy Burnie led from the start. Beating against a flood tide and a dying 5-8 knot wind meant that those chasing had to stay out of the tide as best as possible. Roger Wickens sailing V26 Danny managed to stay out of the adverse tide the longest and pulled through from 5th place to 2nd as a result. In the second race V14 Jabberwocky sailed by Mike Weston took an early lead as he first chose the left-hand side of the first upwind leg, which paid off handsomely. He extended his lead to win by a considerable distance. Behind him, a dying wind led to some big place changes on the final run downwind. Some boats made big gains, including V26 Danny who pulled through to 2nd place, and V18 Polly sailed by Nick Leach and Martin Evans who finished 4th. The second day of racing on Sunday produced almost identical conditions, with light 6-8 knot breezes. The right-hand side of the course paid off on the first upwind leg with V36 Melody sailed by John Ford getting to the first mark in the lead. However, he was overhauled and V26 Danny took the win. In the final race V26 Danny correctly chose the right-hand side and had a big lead at the first mark which was held to the end. V41 Fleury took second place and V68 Sky sailed by Ollie Gilchrist and Becky Wickens finished third. Overall, Roger Wickens won the Henry Chisholm trophy having sailed a consistent series with two firsts and two seconds. Joe Burnie in V41 Fleury took second and Mike Weston in V14 Jabberwocky was third. The Class is now looking forward to its 95th Anniversary weekend in three weeks’ time.